The intertwined myths of Pandora and Prometheus eerily echo the history of nuclear energy: promise and potential, followed by punishment, and ending with hope and hindsight. With the documentary film “Pandora’s Promise” set to premiere on CNN on Nov. 7, FCW columnist Margaret Harding explores the parallels. The myths of Pandora and Prometheus are some of the most interesting of the Greek myths. What I didn’t realize until recently is that these two myths are related. Prometheus—whose name means “forethought” or “forward thinker”—was a Titan who helped to create humans and stole fire from Zeus and the rest of his Olympus gang to help humans live a better life. For his troubles, Zeus eventually chains him to a rock and has an eagle eat his liver each day. The liver grows back each night so that the punishment can be eternal. Many know this myth and many nuclear projects use the word “Prometheus” in honor of his actions. Certainly, given nuclear energy’s potential it feels a great deal like we’ve stolen the ultimate fire from the universe. Pandora, though, I was less familiar with. she’d been told to keep shut. 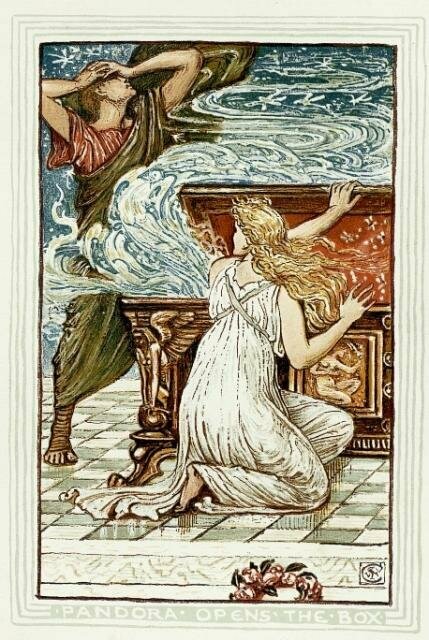 We’ve all heard the phrase “opened Pandora’s box” to connote something that someone had done that created all kinds of problems. Anti-nuclear activists like to describe nuclear technology as an act of opening a Pandora’s box. They almost gleefully describe a litany of ills and problems that the curious scientists that developed this technology have opened with their discovery. When the documentary “Pandora’s Promise” was released this past summer, and director Robert Stone explained that Pandora’s myth ends with the revelation that hope for all mankind was at the bottom of the box, I decided to investigate a bit further the story of Pandora. Who was this Pandora woman anyway? Pandora—the name means “all gifts”—is the first human woman in Greek mythology. Before her, all females were either gods or Titans. Zeus demanded that the other Olympian gods create her in order to play a trick on mankind as punishment. What transgression was Zeus so angry about? He was angry because Prometheus stole fire and gave it to mankind. Depending on the version of the myth, the gods first tried to give her to Prometheus, who recognized the potential trick and refused her. The gods then give her to Epimetheus, Prometheus’s brother. Epimetheus means “after thought” or “hindsight.” He’s less well known than Prometheus, mostly because he always failed to plan ahead. These myths are compelling. Nuclear technology is indeed the fire we stole from the gods. As mere mortals, it has taken thousands of competent and dedicated engineers and scientists to wrest this fire from Olympus and bring it to mankind. Some days, it certainly feels like our livers are being pecked out by something—and that, like Prometheus, we are being punished. However, the campaigns by anti-nuclear activists over the past several decades now appears to be Epimetheus-like. Lacking any foresight, they’ve been seduced by a pretty vision of the future. The ills our continued reliance on fossil fuels has created certainly seems to be Pandora’s box. Our air is dirtier, our energy more expensive and less reliable, and our future less certain because of the delays in getting nuclear energy used more widely, not just in the U.S, but globally. But there is still hope at the bottom of that box. Many environmentalists have rejected the traditional anti-nuclear stance. There has been quiet talk in the corners of the movement that perhaps that knee jerk stance was wrong. The documentary “Pandora’s Promise” brings that discussion into the forefront and perhaps begins to get us to the bottom of that box and to the hope that it brings.